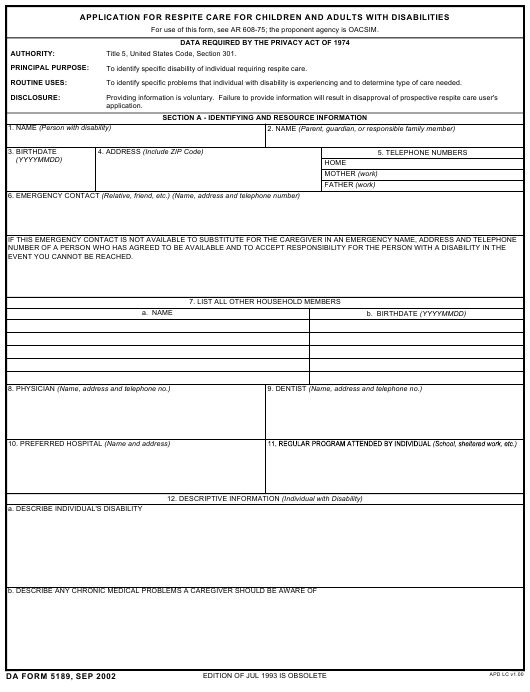 DA Form 5189 - also known as the "Application For Respite Care For Children And Adults With Disabilities" - is a United States Military form issued by the Department of the Army. The form - often mistakenly referred to as the DD form 5189 - was last revised on September 1, 2002. Download an up-to-date fillable PDF version of the DA 5189 down below or look it up on the Army Publishing Directorate website. For use of this form, see AR 608-75; the proponent agency is OACSIM. To identify specific disability of individual requiring respite care. To identify specific problems that individual with disability is experiencing and to determine type of care needed. EVENT YOU CANNOT BE REACHED.